Everyone suffers. If you live long enough, even if you haven’t known great trouble in your life, you will at some point. Others have tried to destroy the impact of suffering by re-framing it in life. Gautama Buddha (the Buddha) did this by determining that “all of life is suffering” and the best way to deal with suffering is to follow the “eight-fold path.” In it, the Buddha believed that one could eradicate suffering by working through this path to achieve wholesomeness or perfection in life. I do not cease to give thanks for you, remembering you in my prayers, that the God of our Lord Jesus Christ… may give you the Spirit of wisdom and of revelation in the knowledge of Him, having the eyes of your hearts enlightened, that you may know what is the hope to which He has called you, what are the riches of His glorious inheritance in the saints, and what is the immeasurable greatness of His power toward us who believe according to the working of His great might that He worked in Christ when He raised Him from the dead and seated Him at His right hand in the heavenly places, far above all rule & authority & power & dominion, and above every name that is named, not only in this age but also in the one to come. No, Paul is praying to God that God would give Christians (followers of Christ) the Spirit of wisdom & revelation in the knowledge of Him–having the eyes of your hearts enlightened. He is praying that God would do a work IN THEM that they could not do themselves. When life gets impossible, we ALL have the tendency to become atheists–living through our pain as if God doesn’t exist. But Paul is praying that God would give us eyes to see GOD THROUGHOUT ALL OF LIFE. In the verses above, Paul states that believers have an inheritance of glorious riches and that there is an immeasurable limit to the greatness of God’s power toward us. Paul even says that this power is the same that God used when He raised Jesus from the dead! And Paul prays that God would open our eyes NOW so that we might see evidence of our inheritance NOW!! Paul is not talking about money; he is talking about spiritual blessing–true riches. Joy in the midst of heartache. Hope in the midst of darkness. Flourishing in the midst of famine. The Holy Spirit, who dwells in the lives of Christians IS a “splash-over of heaven” in the life of every Christian. And His job is to enable you to see evidence of your eternal inheritance right now in your life! 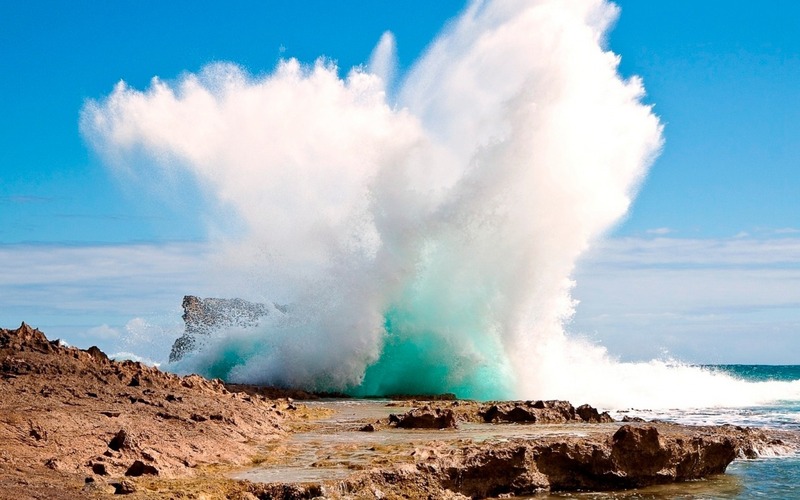 Just like the ocean (which is limitless in its scope–we can’t see the end of it) crashes into the rocks and some of its spray lands on the rocks, the Holy Spirit helps the Christian to see RIGHT NOW evidences of his/her eternal inheritance that has already spilled over into life. Evidence of eternal inheritance has already landed on the rocks of your life, Christian! This week is Thanksgiving. My prayer for everyone is that God would open your eyes to see clear-cut evidence of your eternal inheritance spilling over into your life today.